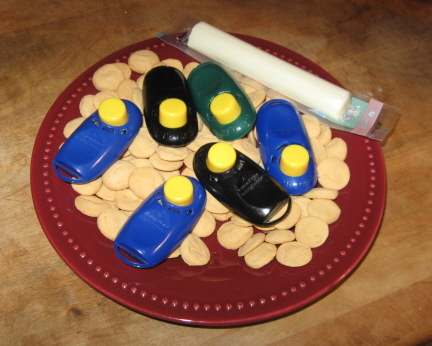 Would Clicker Training Help the MVC? | From the Seasonally Occupied Territories . . .
Would Clicker Training Help the MVC? What to make of last Thursday night’s Martha’s Vineyard Commission (MVC) meeting, at which a motion was made to rescind the October 6 vote to approve the roundabout project, with certain conditions pertaining to bicyclists, pedestrians, bus stops, and landscaping? Once again, the discussion and the decision added up to less than the information that went into them. When I got home that night, I didn’t know what to say. I was no more inspired by Friday afternoon, when I drove onto the 3:45 boat en route to a dog training seminar in Taunton. Maybe not thinking about roundabouts for 36 hours would clear the murk and muck out of my brain? Well, it did and it didn’t. Bear with me while I go off on what looks like a tangent. The training seminar was taught by Jane Killion, author of When Pigs Fly: Training Success with Impossible Dogs. Jane raises and breeds bull terriers. Bull terriers aren’t easy to train, which is to say that the methods that work fine with “biddable” dogs like Labs, goldens, and Australian shepherds don’t work well with them. In learning how to train her bull terriers, Jane studied learning theory and behavior modification and developed a training method that works with “impossible” dogs. Alaskan malamutes aren’t biddable either. At the age of one, my Travvy wasn’t just an Alaskan malamute; he was a reactive, impulsive Alaskan malamute with a high prey drive and a low tolerance for frustration. I was in over my head — but it had already dawned on me that Trav was my guide on a journey into new territory. 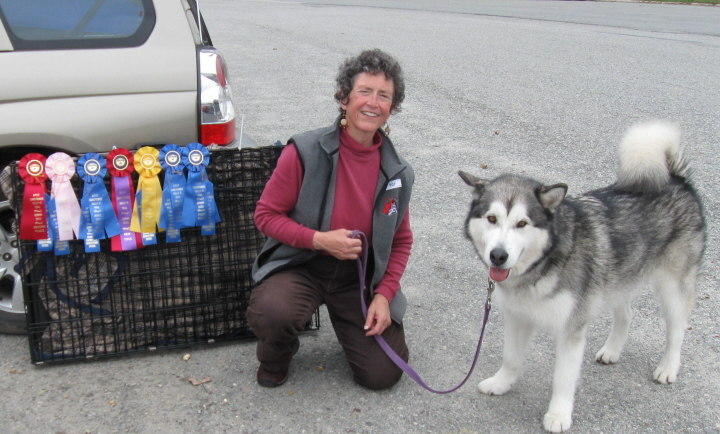 We’re seriously lucky on Martha’s Vineyard to have an excellent dog trainer: Karen Ogden of Positive Rewards Dog Training. Karen recommended When Pigs Fly. I’ve been a Jane fan ever since. If positive methods got *us* this far . . . Both Jane and Karen employ “positive” methods that encourage the dogs to figure things out instead of being force-fed solutions by their handlers. It’s challenging, it’s fun, and — most important — it works. So — if reinforcement techniques work with “impossible dogs,” would they work with our elected and appointed representatives? Even my casual acquaintance with learning theory and dog training leads me to suspect that these principles explain plenty about what happens in public life. Politicos are like Travvy, me, and all the rest of us: if a behavior is continually reinforced, it continues and gets stronger; if it’s not, it eventually goes away. Trav is reinforced by the click of a clicker, because he knows that after the click comes good stuff like turkey dog bits, string cheese, and being able to sniff a particularly redolent shrub. Politicos are reinforced by stuff like money, acclaim, and (one hopes, at least sometimes) the satisfaction that comes with doing a good job. OK, I’ve convinced myself. I’m going to try reinforcement techniques in this account of the Martha’s Vineyard Commission meeting. Commissioner Lenny Jason moved to rescind the October 6 vote. “We didn’t approve a plan, we approved a concept,” he said. The plan the MVC majority voted to approve was only 25% complete, no traffic studies had been done, no environmental impact statement had been filed. The nominal applicant in this case is the Town of Oak Bluffs; the one with the bucks is the Commonwealth of Massachusetts. We “treated the state differently from other applicants,” noted Mr. Jason. Mr. Jason gets a big click and all the string cheese he wants. One pro-roundabout commissioner from Oak Bluffs launched into a long preamble about how carefully he had considered the matter, then said that voting to rescind the October 6 vote would undermine the credibility of the Martha’s Vineyard Commission. The other Oak Bluffs commissioner, also pro-roundabout, said that rescission would lead people to question the MVC’s integrity. Note that I am employing “negative punishment” by not mentioning the names of these individuals, on the theory that for politicos, as for writers, even negative publicity is good publicity. The main point is that the “credibility” and “integrity” of the MVC are theoretical concepts that may not exist in the real world. Public opposition to the roundabout is running something like 3 to 1. Most people who oppose the roundabout are not impressed by the MVC’s handling of the subject. Another pro-roundabout commissioner — not from Oak Bluffs — discoursed at some length about the anti-roundabout comments she had read in the press, including the Martha’s Vineyard Times website. She was not happy with this “intimidation” (her word). She feared that commissioners appointed by their town’s board of selectmen might feel especially intimidated. No click for her — but I’ll toss her a treat for calling Mr. London’s memo “ridiculous.” The hearing officer, Doug Sederholm from Chilmark (name semi-redacted), was audibly annoyed by this. Ned Orleans said that he did not feel intimidated, even though he was appointed to the MVC by the Tisbury board of selectmen, two of whom are pro-roundabout. Mr. Orleans voted against the roundabout, and for the rescission of the October 6 vote. A big click for him. Another click for Mr. Jason, too, for noting that if you take a stand, half the people will disagree with you, and “if anyone at this table is intimidated, they should get up and leave.” He also took issue with the notion that rescinding a vote might be seen to undermine one’s credibility or integrity. He was raised to acknowledge his mistakes, he said. Bravo. Jim Joyce of Edgartown expressed reservations about the October 6 vote, which was taken at almost 11 p.m., when everyone had been itching to get out of there for almost an hour. A click for him: the fact that he voted for the roundabout didn’t prevent him from noticing that the vote itself was problematic. So after yet another lackluster discussion the time came to vote. Voting for rescission: Jim Joyce, Ned Orleans, Camille Rose, Linda Sibley, Christina Brown, and Lenny Jason. Voting against: Doug Sederholm, Holly Stephenson, John Breckenridge, Erik Hammarlund, and Fred Hancock. Oh wow, I just had time to think; 6 to 5! We did it! But no: Chris Murphy, current MVC chair, once again snatched stupidity from the jaws of reason by voting no: a tie vote meant the motion to rescind failed. “He’s got balls,” Lenny Jason muttered, loud enough for the whole room to hear. Granted. What he hasn’t got is class. Brian Smith of West Tisbury, a well-informed and articulate voice against the roundabout, was unavoidably out of the country and not at the meeting. Had he been present, the vote would have been 7–5, and Mr. Murphy’s grandstanding would have been futile. The word “schmuck” comes to mind. This entry was posted in dogs, Martha's Vineyard, public life and tagged dog training, Lenny Jason, MVC, roundabout, Travvy. Bookmark the permalink. 5 Responses to Would Clicker Training Help the MVC? Hurrah for Mr. Jason. When did it become a crime for one to change their mind after additional input? I would never vote for a politician who didn’t “flip-flop” once in a while. Shoe-muck. Chris Murphy is currently vocal in his opposition to the Coast Guard’s plan to rebuild its boathouse at Menemsha harbor. (The old one burned down in July 2010.) It’s not needed, he says, with good reason. Menemsha is in his hometown of Chilmark. The blinker intersection is halfway across the island. It seems his thought process gets shakier the further he gets from home. “Schuck” doesn’t sound like much of a click. And some day I’ll spell it right.